Seoul, South Korea – South Korean President Moon Jae-in, joined by more than 200 officials, is set to embark on a high-stakes trip to Pyongyang for talks with his North Korean counterpart Kim Jong-un. On an exceptionally rare occasion in the reclusive country, the first moment of the two leaders’ encounter in North Korea’s capital, as well as the summit’s key events, will be beamed live to the rest of the world. Moon’s three-day trip, which starts on Tuesday and is only the third of its kind for a sitting South Korean president since the division of the Korean Peninsula, comes amid a diplomatic quandary over stalled nuclear disarmament negotiations between North Korea and the United States. Washington wants to see a concrete timetable and actions for North Korea’s denuclearisation before beginning to dole out any rewards to the country, which has a track record of defaulting on previous nuclear deals. North Korea, on the other hand, has called for the US to provide a security guarantee through a joint declaration of a formal end to the 1950-1953 Korean War, which ended in an armistice rather than a peace treaty, and left some international sanctions imposed on impoverished North Korea. In late August, US President Donald Trump cancelled Secretary of State Mike Pompeo’s planned visit to Pyongyang at the 11th hour, citing a lack of sufficient progress made since his historic summit with Kim in Singapore in June. The impasse presents an enormous challenge to pro-engagement Moon, who has been asked by both sides to play the role of mediator. “If it becomes clear that the talks with North Korea are stuck, the hardliners in Washington and Seoul, especially in Washington, will have an upper hand and probably will start to demand a speedy return to their hardline maximum pressure policy,” Andrei Lankov, professor at Kookmin University in Seoul, told Al Jazeera. Lankov, who is among the many long-time North Korea watchers who are sceptical about the authenticity of the pledged nuclear disarmament, argued that South Korea’s delegation would work hard to put on a theatrical performance that would create a sense that everything was fine. “It is smart diplomacy, because it creates an environment where hardliners would have problems in pushing through their bellicose policy,” he said. Denuclearisation is generally understood to be a time-consuming process, involving many stages before the dismantling of nuclear weapons. “If you do this step by step, it becomes virtually impossible to achieve the denuclearisation within two-and-a-half years,” Moon Chung-in, special adviser to the South Korean president, told foreign media in his personal capacity, referring to Kim’s recent offer of Trump’s first term as a target timeframe. The adviser argued the upcoming summit could serve as an opportunity for South Korea’s leader to persuade his counterpart on a simultaneous exchange approach, which he would later propose to Trump, too. He floated one possible scenario that would see North Korea agreeing to an extraordinary concession such as allowing the US to take out some – if not all – nuclear weapons, and in return the US would be willing to ease some economic sanctions. At the upcoming summit, another important matter on South Korea’s agenda would be improving its own relations with North Korea. In the economic field, there are relatively innocuous projects – such as cooperation in the forestry sector -that would not violate a string of sanctions from the United Nations Security Council, Bong Young-shik, a research fellow at Yonsei University Institute for North Korean studies, told Al Jazeera. 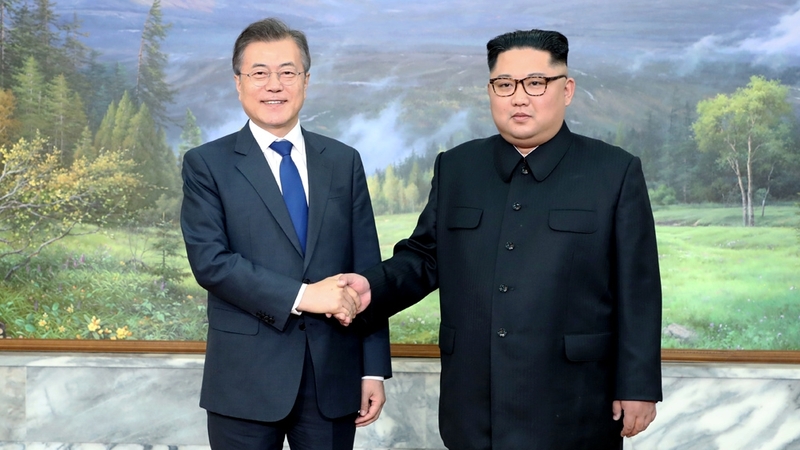 The two leaders are also expected to discuss ways to ease tensions along one of the world’s most fortified borders, a follow-up on the Panmunjom Declaration after their inter-Korean summit on April 27. The militaries from both sides have been holding meetings to discuss removing army guard posts and landmines inside the Demilitarised Zone and setting up a “maritime peace zone” in the West Sea, a scene of numerous deadly military skirmishes in the past. “It would be tangible achievements of this summit if the two leaders agree on measures for conventional arms reduction,” Bong added. Experts have long acknowledged that it would be quite inconceivable for either country to use nuclear arms as its first choice of weaponry in modern-day warfare due to catastrophic consequences, yet warn of the possibility of an accidental clash rapidly escalating into an uncontrollable situation.